Clubs, associations, athletes – all of them are top-notch in the social web. 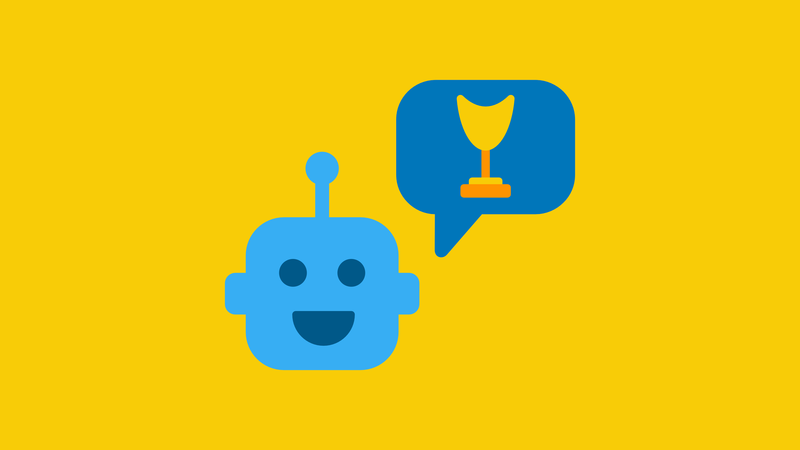 It is even more surprising that topics such as messenger marketing and chatbots may not seem to be very relevant in these sectors. 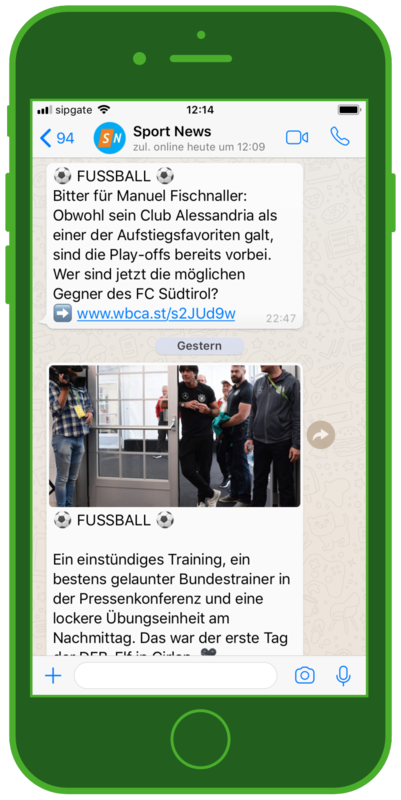 In the first part of our sports special, on occasion of the #dse17 in Berlin, we are going to take a closer look at “Content Distribution via Messenger”aka Facebook messenger and WhatsApp for Sports Clubs. It is no secret that messengers are on the rise worldwide. 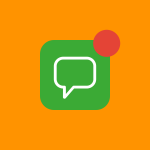 Yet, the fact that WhatsApp reaches 1,3 billion users and Facebook Messenger reaches about 1,2 billion users per month worldwide is surprising. The usage of messenger in Germany lies about 70 percent, of which WhatsApp takes 60 percent of the users. In comparison: Snapchat is on the bottom of that ranking list with only 2 percent. Sports businesses had an exciting and rapid developement in the past few years. More and more clubs, especially the professionals, are turning into media brands and try to increase their reach for sponsoring areas or merchandising. In addition, internationalization is an important matter – without clubs losing its bond towards their fans and tradition. Messenger Marketing is able to provide added-value to all of those four categories! 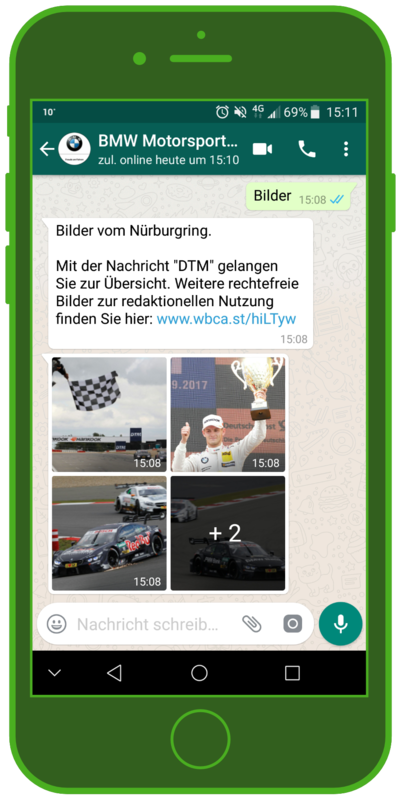 WhatsApp in Sports Businesses – the Optimal Choice for Content Distribution, Sponsoring and Merchandising! While many, bigger sports media companies, for e.g. 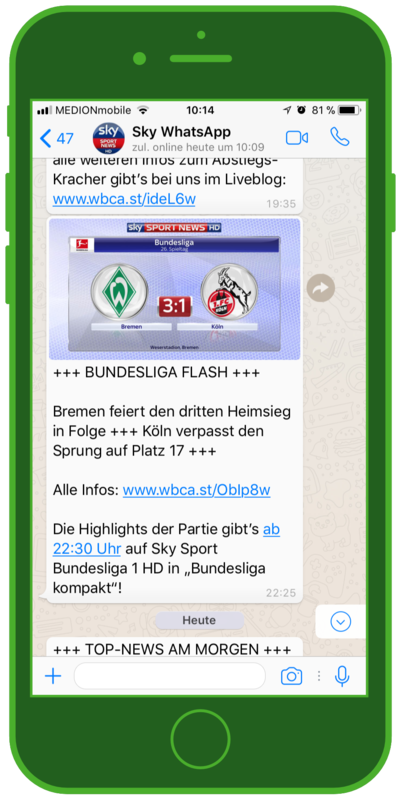 SkySport and Sport1.de, are already intensively using WhatsApp and Messenger for their +++Breaking News+++, sport clubs and associations only discover the benefits bit by bit. Clickrates above 25% – even higher in the field of sports! SkySportNewsHD was one of the first media company, which discovered the chance of WhatsApp and its function as a newsletter and is still using it successfully till this day. 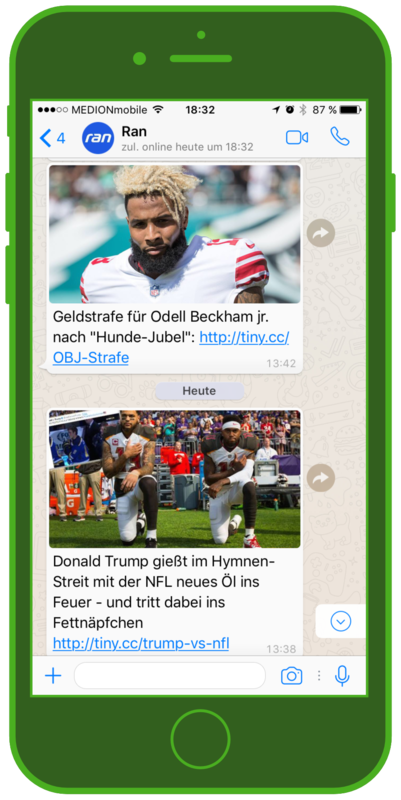 Sport1 and Spox pursue a similar wide communication with breaking news and background information, while ran.de especially scores with their USP #ranNFL. 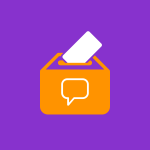 Therefor ran uses the “category function”, which allows them to send the content directly to their target group. This is also interesting for sport clubs. 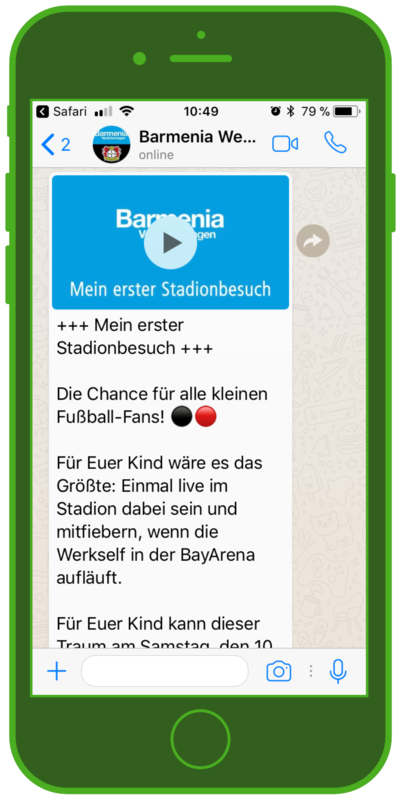 Eintracht Frankfurt, FC Bayern Munich Basketball or the Augsburger Panther demonstrate it and inform their fans in an entertaining way and directly through Messenger such as WhatsApp or Facebook Messenger. More and more sponsors recognize the trend and use the high emotionality and topicality of sport content as an extension of their sponsoring. Be it BWIN or MAN with general information or Barmenia with specific content regarding Bayern 04 Leverkusen. There is still potential for clubs! A Messenger channel in good order with many subscribers is an interesting option for marketing, too. While everything in the stadium is presented by a sponsor, the enormous reach of Messenger is barely used yet. So whilst big clubs and media companies primarily focus on content distribution for reach and sponsoring proceeds, WhatsApp offers for smaller clubs and associations an alternative to Facebook and email to communicate with members and fans. Messenger marketing and especially WhatsApp are perfect to communicate with fans and members. It opens up new possibilities of sponsoring, sale of jerseys and merchandising in general. Clubs, athletes and associations should follow sports media companies’ example, which already practice it that way professional and successful. 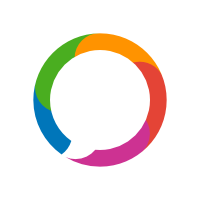 Beside broadcasting – the Content Distribution through Messenger – the importance of 1-to-1 communication between fans and sport clubs also increases. I started an experiment with all national league Clubs and asked them on Facebook: “Where am I able to purchase tickets for the next match?” – a legitimate question, assuming that sport clubs would like to sell their tickets. However, the result was quite different than expected, read more about it here.